Blog - Sale! 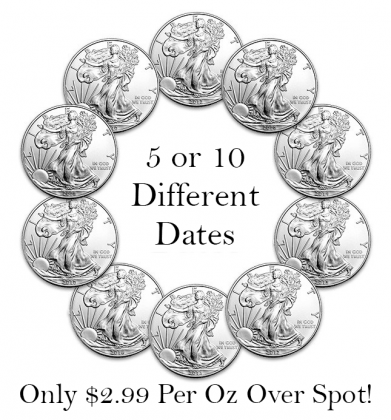 5 or 10 Different Silver Eagle Dates @ Just Spot + $2.99! Earlier this week, we bought a substantial hoard of fresh backdated Silver Eagles. The price was right and we couldn’t say no. When the coins arrived, we were surprised at how many different dates we received! This group contained a wide variety of prior-year issues. Thanks to this lucky purchase, we can offer you these coins with an outstanding mix of dates at an exceptionally low price. 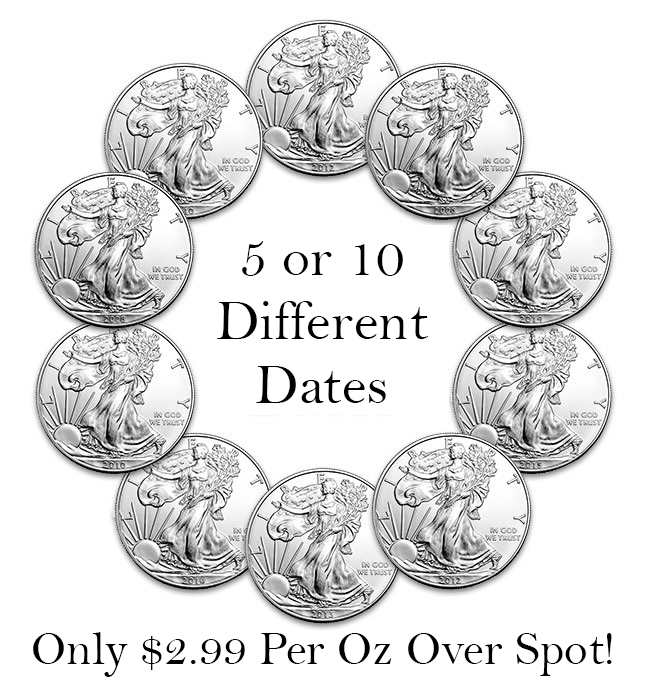 While supplies remain, we can offer you can offer you 5-date and 10-date Silver Eagle sets at $2.99 per coin over spot. That is, each set contains 5 or 10 different dates – all in Gem Uncirculated! This is a great way to own an instant “mini-collection” of Silver Eagles at a fantastic low premium. Backdated Silver Eagles typically command a hefty premium compared to current-year issues. Once a date goes out of production, the market supply often vanishes quickly and prices rise. Within the past few years, prior-date Silver Eagles often commanded a $4+ premium in the wholesale market. Even today, many major retailers are quoting $4-$6 over spot for coins minted within the last decade! This $2.99 premium is valid while inventory remains; we encourage you to take advantage of this while we have coins available.